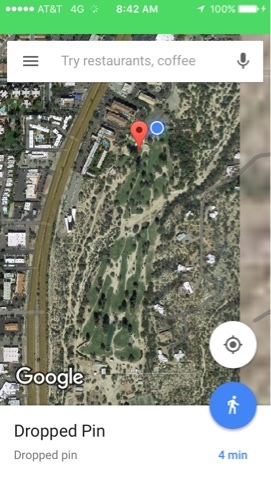 After saying I normally play disc golf for free, I see there is a new disc golf course in Tucson, that is called Quail Run, that is played along with ball golf. 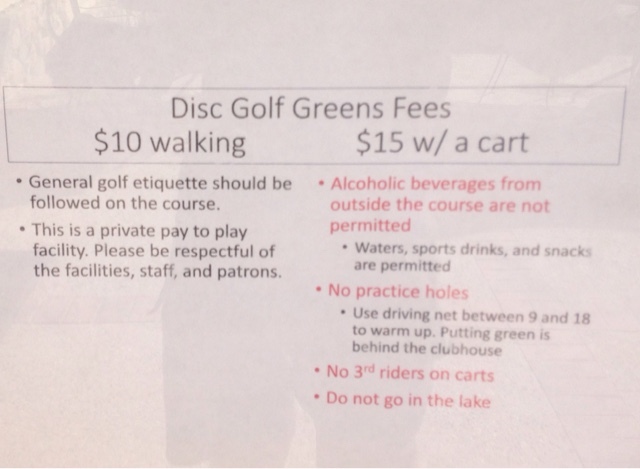 Of course ball golf pays to play so I expected there would be a fee. There are a couple private disc golf courses near where I live that you pay to play and what is nice is that they are well maintained. Many public courses are supported & maintained by disc golf groups or clubs. When they have a donation box I like to contribute. I think a couple to $5.00 is fair. I decide to take a trip over to check it out on Friday 2/19/16 (Day 47). 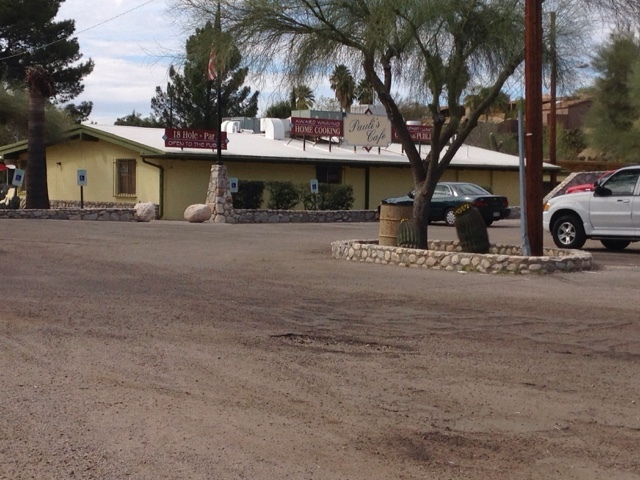 It's a small tight course tucked in a little valley off the main road, that made it a bit hard to find. Ouch! $10.00 to play. Well, I'm here and I want to play so I pay out the money but font opt for a golf cart. I tee off behind a couple playing ball golf. You let them play the hole and then you play the basket after they are off the green. Just like the next golfer would let people off the green before hitting the ball. 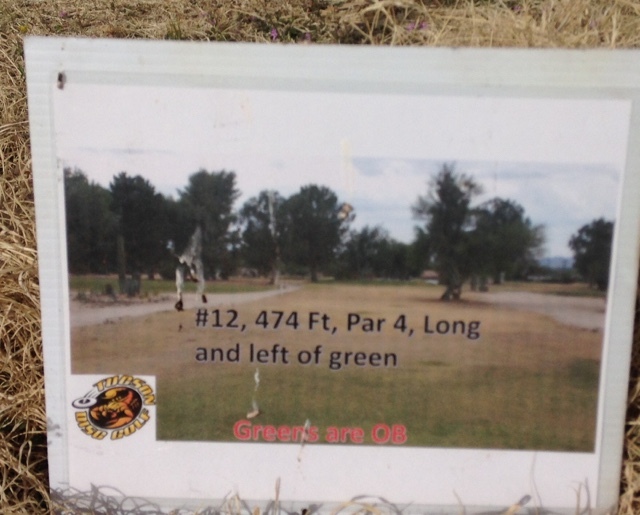 They have these plaques for each tee telling you the par for the hole and where the basket is. Very necessary since it is a tight course and you an often see a couple baskets out there. The first 9 holes have white giant nuts and bolts welded together to define the tee box. The second 9 tees are red. 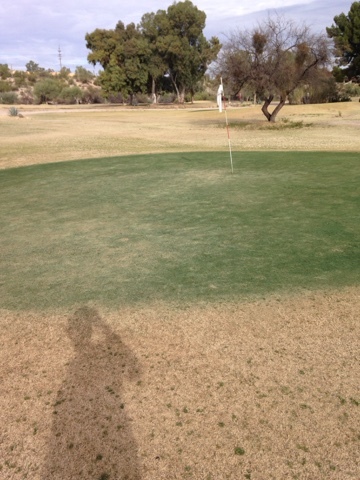 Greens are out of bounds for disc golfers. Luckily my throws rolled off. They are also painted the nice green color. I liked the course and the waits between holes had benches to rest on, often shaded. The course was reasonably challenging with one water crossing that I decided to lay up to so I wouldn't go on. The same water feature had another basket next to it making it difficult not to go wide or overshoot and then your on the water. A few other holes increased difficulty by tucking the basket off to the side blocked by trees. The suggestions I would make would to improve the way they display the hole information. 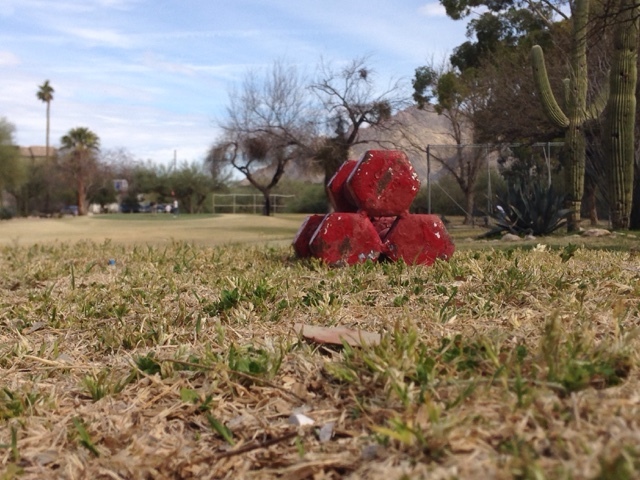 They have it laying on the ground at the bottom of the post for the ball hole information. I feel it was temporary that has turned into permanent. Since we are playing treat us like paying customers and make us feel more welcomed. 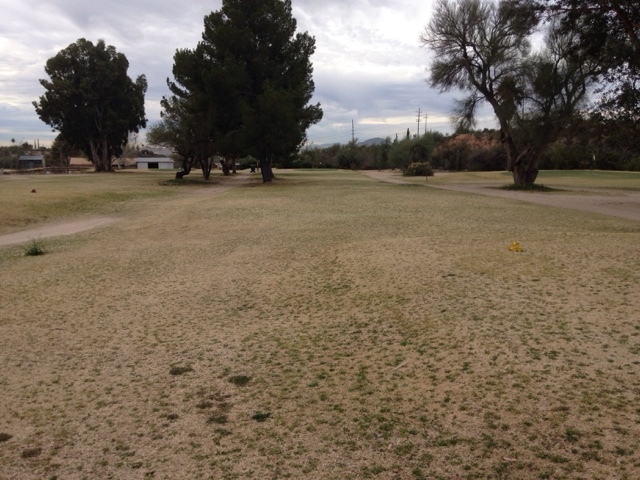 Since Marina's course is in such disrepair this course is the best in the area that I've been to. Real disc golfers don't use golf carts. I also like how they feel the need to tell you not to take the golf cart into the lake. Thanks captain obvious! I'm smiling as there were two groups of disc golfers that were using golf carts. I would have thought you would have picked up on no outside beer on the course. But apparently weed isn't outlawed. Haha! When I was bored waiting for the next hole/basket to open up - I guess I broke the rules by practicing my putting on the last basket.